Based in Ashbourne, County Meath, McCabe McGinn Construction & Management Ltd was established in 2012. The company has experienced steady growth in the last five years and positioned itself as one of the leading Fit-Out specialists within the Retail, Leisure and Commercial sectors. McCabe McGinn Construction & Management Ltd provide the necessary knowledge, experience and resources at an accessible and personalised level. They ensure that their clients’ needs and expectations are met to a consistently high level and a professional standard. Company directors Kevin McCabe and Paul McGinn possess a combined experience of over 30 years in Fit-Out, including many years in the world of luxury retail fit-out. They strive to deliver an innovative and hands-on approach to all their projects, providing a service based on quality, reliability and teamwork. McCabe McGinn offer a comprehensive service with the ability to deliver complex projects in a fast-track environment, maintaining a commitment to partnership and a reputation for reliability. With the necessary resources and trusted supply chain partners, McCabe McGinn are able to provide high-quality services throughout Ireland and the UK. “The majority of our work has historically been in the retail sector, with Brown Thomas, Arnotts, Dunnes Stores and Superdry forming the backbone of demand. 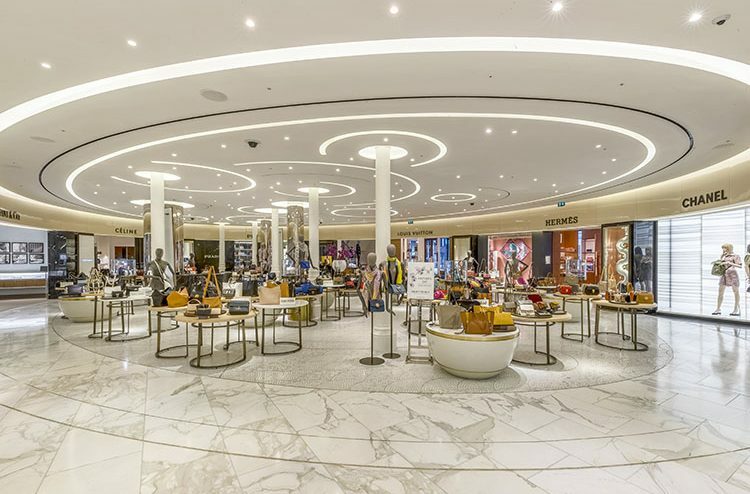 We also have a portfolio of high-end luxury fit-outs under our belt for clients such as Louis Vuitton, Hermes and Prada. McCabe McGinn take a strategic approach to every aspect of client service, through Quality Control, Project Management, Financial Controls and Health and Safety. The company’s approach involves monitoring the competency and performance of all suppliers and ensuring that quality and standards are maintained. From site set-up to project hand over, the project management capabilities of McCabe McGinn play a crucial role in finalising contracts on schedule and to the highest quality standards. Working closely with the designers, the company transform creative concepts into reality. McCabe McGinn coordinate and manage all aspects of the project until ready to hand back to the client. Quality Control is achieved by maintaining close links with a trusted, specialist supply chain. The company have selected partners to deliver tailored joinery, millwork, and metalwork solutions. All the stakeholders fully appreciate that attention to detail is vital in the successful completion of any project. 2018 saw McCabe McGinn achieve accreditation in ISO 9001; ISO 14001 and ISO 18001. “Like everyone else we went through a hard couple of years but we had a number excellent clients and exceptional projects that kept us going during the lean years,” answered Kevin when asked: ‘how is business going at the moment?’. Kevin continued: “Attention to detail is always a big thing for us. As directors, we have always adopted a hands-on approach and we still like to do that because our clients want to meet and deal with McCabe and McGinn! As a result, we’ve attracted a lot of repeat business and that has been the bedrock of the company over last couple of years. “We’re hoping to bring in more and more new clients in the coming years from the leisure and commercial sectors. We pride ourselves on offering a professional service on a personalised level. We are confident we can meet and exceed our clients requirements to a high standard,” he concluded.